Rudolph the Red Nosed Reindeer is a fictional reindeer with a glowing red nose. He is popularly known as “Santa’s 8th Reindeer and is the lead reindeer pulling Santa’s sleigh on Christmas Eve, bringing gifts to children who have been good. The luminosity of his nose is so great that it illuminates the team’s path through inclement winter weather. 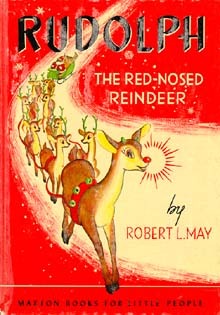 Rudolph’s glowing red nose made him a social outcast. The other reindeer harassed him mercilessly and excluded him from their fun because of this unusual trait. However, one Christmas Eve Santa Claus was having difficulty making his flight around the world because it was too foggy. When Santa went to Rudolph’s house to deliver his presents he noticed the glowing red nose in the darkened bedroom and decided it could serve as a makeshift lamp to guide his sleigh. He asked Rudolph if he would lead the sleigh for the rest of the night. Rudolph agreed, and was rewarded with recognition and acceptance amongst his fellow reindeer for his heroics that helped Santa Claus. Christmas is about love and fertility. Whether one is religious or not, this special time is celebrated on a global scale. In fact, from the beginning of human time, this astronomical event, the winter solstice—the shortest day and longest night of the year—has inspired celebration of the subsidence of light into darkness.